Check out AnthroDish news here! Last week AnthroDish’s Sarah was invited to speak with CTV’s Todd van der Heyden on his weekly radio show, Viewpoints. We dove into the changes to Canada’s Food Guide and the cultural and social implications these changes may have. Check it out below, or download the podcast episode on iTunes (episode 82)! Sarah on CHCH News for Canada's Food Guide Release! Had the opportunity to speak with Kelly Noseworthy of CHCH Evening news last night on the release of Canada’s 2019 food guide. She compiled a great range of perspectives on how the guide will shape food choices and behaviour. Check out my brief cameo around the 2 minute mark! New Year's Social Media Giveaway! I thought it would be fun to kickoff the New Year on a positive note with a super cool giveaway from AnthroDish! The giveaway package includes “Food” by Jennifer Clapp, “Reconstructing Obesity,” an edited volume by Megan McCullough and Jessica Hardin (which has some great intersectional approaches to weight and body stigma), and an AnthroDish water bottle and notebook! To enter, submit a rating and review of AnthroDish on iTunes and email a screenshot to anthrodish@gmail.com. Contest closes January 17th at 12pm EST. Open to Canadian and US residents. The winner will be selected at random and contacted via email. Good luck! AnthroDish is heading to Portland! Thrilled to share that I’ll be heading to Portland, OR for the Society for Applied Anthropology 2019 meeting! I’ll be speaking on how to use podcasts as a form of ethnography in digital food activism, as part of a panel titled “Ethnographic Perspectives on Food Activism and Social Justice” lead by Charles Klein. The meeting runs from March 19-23, 2019 - so if you’re interested in listening to what sounds like a fascinating panel on food activism, or want to check out some other awesome applications of anthropology - check out the link below for more details! Excited to share that I’ll be in San Jose, CA from Nov 16-18 for the AAA meetings this year. I’ll be at the Podcasting Roundtable at 8 am on Nov 18th, Podcasting and Adapting Public Anthropology for the 21st Century , organized by Ian Pollock of The Familiar Strange. Looking forward to some exciting discussions about podcasting as a key communication tool for different audiences in anthropology. Come say hi! Social Media Fall Harvest Giveaway! Excited to share that our fall harvest giveaway is here! When Culturally Modified first contacted me about the potential for us to do a crossover giveaway, I was so floored - it was an honour to be collaborating with an online magazine that does such a brilliant job bringing cultural resource management to life! And THEN we added in Trina Moyles, author of Women Who Dig: Farming, Feminism, and the Fight to Feed the World (and former AnthroDish Guest! ), and Emily Corbett, the creator of Northshore Apothecary, and it quickly became a dream team! 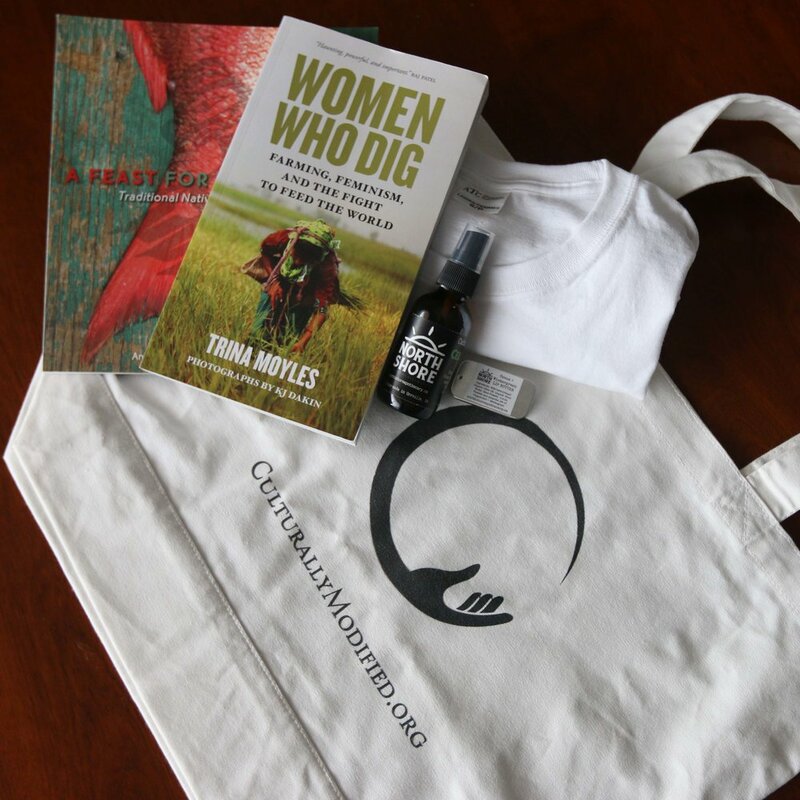 We’re giving away a gift package that includes two books (Women Who Dig by Trina Moyles and A Feast for All Seasons, an Indigenous cookbook by Witsuwit’en chef Andrew George Jr.), a T-shirt from AnthroDish podcast, Cabin + Body Spray and Lip Butter from Northshore Apothecary and a Culturally Modified canvas tote. To enter, follow all four participants (tagged below) on Instagram and comment on any (or all!) of the giveaway posts by tagging two friends who love culture… or food… or food culture! You can enter multiple times by commenting on more than one post! When our draw happens in early December, you need to be following @northshore_apothecary, @womenwhodig, @anthrodishpodcast and @culturallymodified. What happens when we shut off technology and simply spend time alone? What role does food play in slowing down time, or having time alone? My interview with Dino Tinapay (episode 9) on dining solo was featured in online magazine Culturally Modified for their TIME issue, where we explore these themes and more! Culturally Modified shares research, stories, and experiences about our cultural resources - and they do a marvellous job exploring wide topics in varied ways. The TIME issue also has a piece by former AnthroDish guest, Trina Moyles! It was such a nice surprise to be featured in Savvy Mom’s article “6 of Our Favourite Podcasts by Women” earlier this week! This list includes podcasts that aren’t necessarily based on motherhood themes, but run by women who tackle relatable and cool topics. Very excited to share that AnthroDish podcast is now proudly partnered with the American Anthropological Association. The AAAs have an amazing podcast network, with shows like SAPIENS Podcast, The Familiar Strange, This Anthro Life, Anthropologist on the Street, and so many more! It is truly an honour to be included in this roster of anthropological podcasts. I am so passionate about making anthropology an accessible and interesting tool for folks both inside and outside academia. At a time when our world is increasingly polarized, thinking about the ways in which humans behave, connect, and identify is an important way of understanding each other and where we come from. So happy to be on board the AAA team and excited for all the beautiful human connections that stem from it! We talk all about career goals, motherhood, birth control, anthropology, and somehow she even gets me to speak about my short lived experience in a quasi-cult - eep!